What Problem Does TradeCloud aim to Solve? What Markets Does TradeCloud Serve? How Will the Funds from the STO Be Used? TradeCloud was established in August 2016. In February 2017, the team began building the platform. The platform went live in October of that year. In August 2018, TradeCloud began the STO project. 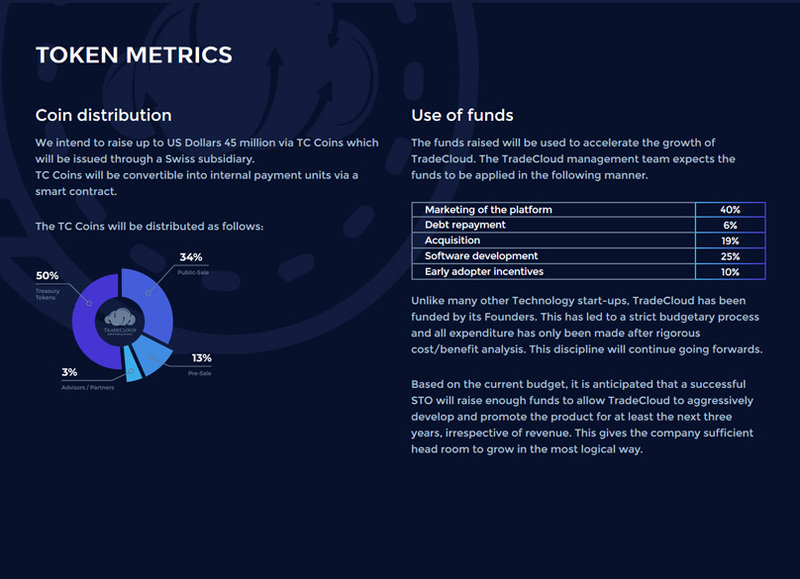 In November 2018, TradeCloud reached several milestones. These included have $500,000M of transactions initiated. It also included 200 customers spread across 36 countries. 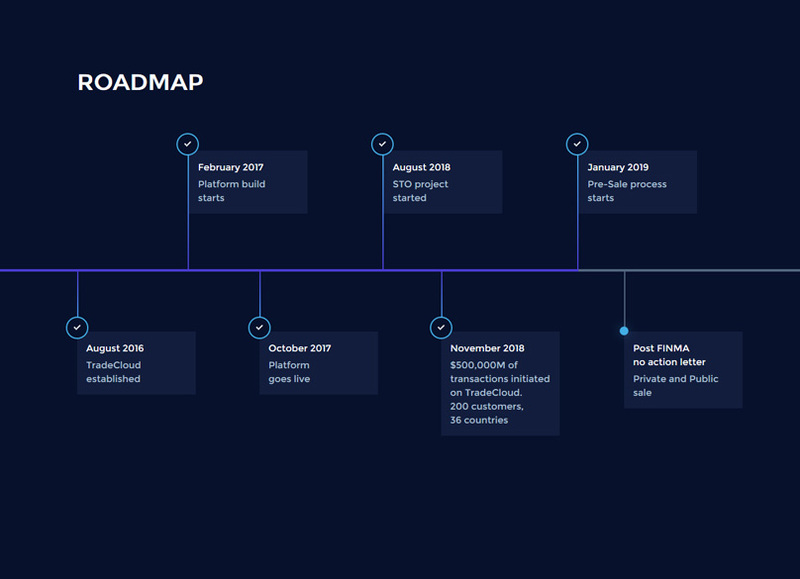 The pre-sale process began in January 2019. This was followed by the public and private sales. As mentioned, the team behind TradeCloud includes leading professionals with experience in technology and commodities. They share a passion to bring the business of physical commodities into the future. Simon Collins has more than 25 years of experience with commodities. Matthew Botell has over 20 years of experience in the physical commodities business. Mark Cheong has held a range of senior Finance and Treasury positions over the years. He has experience in the commodity trade, structured finance, treasury, tax, credit, and legal fields. Justin Wilson has more than 25 years of experience in consulting and IT. TradeCloud also has numerous partners. Blocksmatter AG is a senior advisor. CMP AG is an escrow agent and AML partner. Inacta AG is a blockchain platform provider. Dr. Mattia L. Rattaggi Advisory & Consultancy is a regulatory advisor. Intrum AG is a KYC partner. Volo is a software developer and R3 works on the blockchain. The infrastructure uses Microsoft Azure. 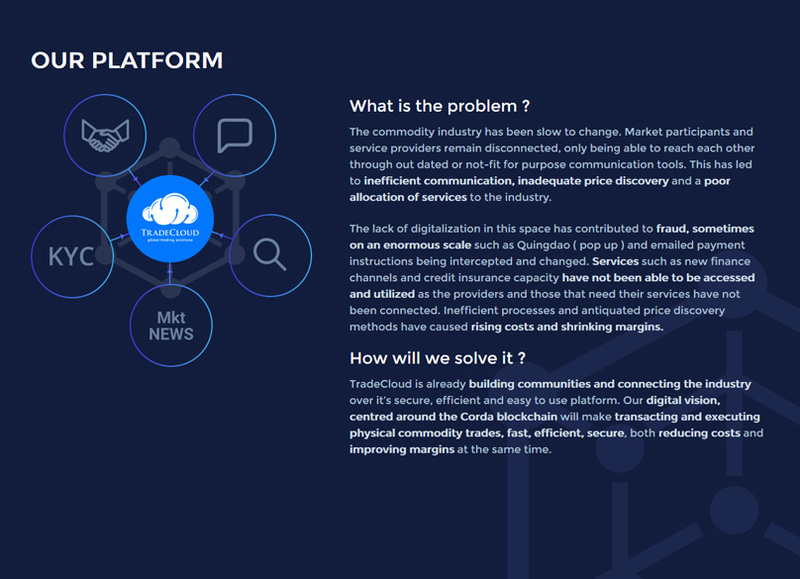 TradeCloud is a platform that aims to bring the commodities industry to the digital world. With the use of the platform, the industry can experience lower costs and improved margins. The project is already well underway with over $500 million USD in trades, 200 enterprises, and 400 users. The team behind TradeCloud has decades of experience in technology, IT, and commodities. The funds raised by the STO will be used to enhance the project, accelerating its growth and usefulness. The project has the potential to be revolutionary for the commodities industry, providing it gets adopted.